To celebrate the first-ever elite women’s competition, A Footy Girl’s Guide to the Stars of 2017 showcases some of the key players to look out for, and reveals how they made it to the top of the women’s game. Players profiled include- DAISY PEARCE, EMMA KING, KATIE BRENNAN, DARCY VESCIO, MADDY COLLIER, KARA DONNELLAN, SABRINA FREDERICK- TRAUB and ERIN PHILLIPS. What age did they start playing footy? What do they love about the game? Who are their role models? What are their greatest talents as players? Find out the answers to these questions and more. 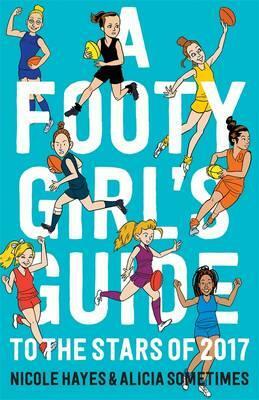 Filled with inspirational stories and fun facts, A Footy Girl’s Guide is an essential read for aspiring footy stars of the future - and all kids who love their AFL.